M. de Coninck, Brussels, 1928, as Jacob Jordaens. with Galerie K. Haberstock, Berlin, 1928, as Jacob Jordaens. Edith mendelssohn-Bartholdy, as Jacob Jordaens. Mrs. M. Ullstein, London as Jacob Jordaens. Anon. Sale, Sotheby's, London, May 14, 1986, lot 23 as Studio of Jacob Jordaens. Anon. Sale, Christie's, London, July 6, 1990, lot 102, as Jacob Jordaens. with Harari & Johns, London, as Jacob Jordaens (Five Centuries of Old Master Paintings, 1991, no. 24). L. van Puyvelde, Jacob Jordaens, 1953, pp. 38, 174, note 50, and 188 and pl. 29, as Jacob Jordaens, described as signed and dated 'I. Ior. Fe. 1641'. M. Jaffé, in the catalogue of the exhibition, Jacob Jordaens, Ottawa, National Gallery of Canada, Nov. 29, 1968 - Jan. 5, 1969, p. 125 as a workshop reduction. R.-A. d'Hulst, Jordaens Drawings, I, 1974, p. 76 as Jacob Jordaens and signed and dated 1641. R.-A. d'Hulst, in the catalogue of the exhibition, Jacob Jordaens, Antwerp, Koninklijk Museum voor Schone Kunsten, March 27 - June 27, 1993, pp. 206-8, under no. A65, and note 5 as 'a variant', and signed 'I.JOR.FE'. Brussels, Musées Royaux des Beaux-Arts de Belgique, Oeuvres de Jordaens et son Atelier, Oct. 27, 1928, no. 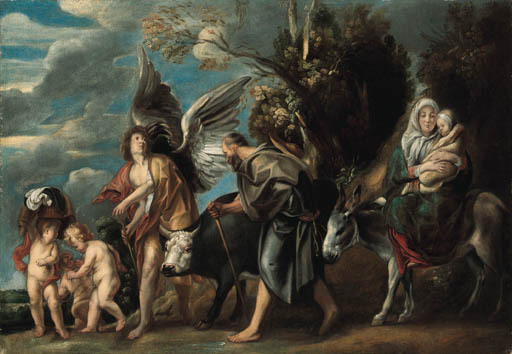 11, as Jacob Jordaens. Professor R.-A. d'Hulst dates the composition to the 1640s (see R.-A. d'Hulst, Jacob Jordaens, 1982, p. 142).